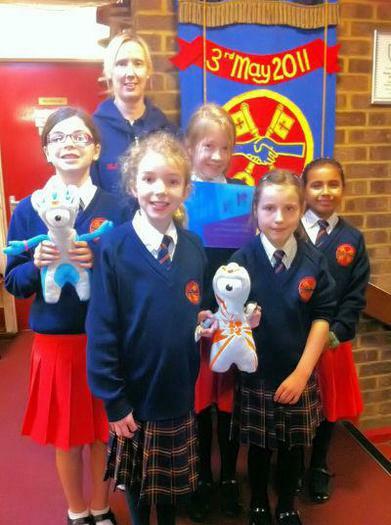 Pupils and teachers at Chalfont St Peter Church of England Academy celebrated this week when they were officially welcomed in to London 2012’s Get Set network, in recognition of their commitment to the Olympic and Paralympic Values. Over the past year the children have been working on a wide variety of projects and competitions, exploring ideas which encourage the celebration of the Olympic in 2012, such as designing a healthy meal for an Olympian, creating Olympic themed artwork and taking part in physical challenges. he London Organising Committee of the Olympic and Paralympic Games (LOCOG) awarded the school a plaque and certificate to acknowledge their involvement in the programme. They now join schools and colleges across the UK as members of the special London 2012 community – the Get Set network and will receive access to exclusive competitions and 2012 Games related opportunities over the coming years. Chalfont St Peter CE Academy was congratulated for being “an excellent example of how London 2012 is helping to spark young people’s imagination, inspiring them to get involved and make a difference. They have clearly demonstrated that London 2012’s education programme extends far beyond P.E and sport. “We are delighted to be involved in the Get Set network and the staff and children are all really looking forward to the build up to the Olympic Games next year.